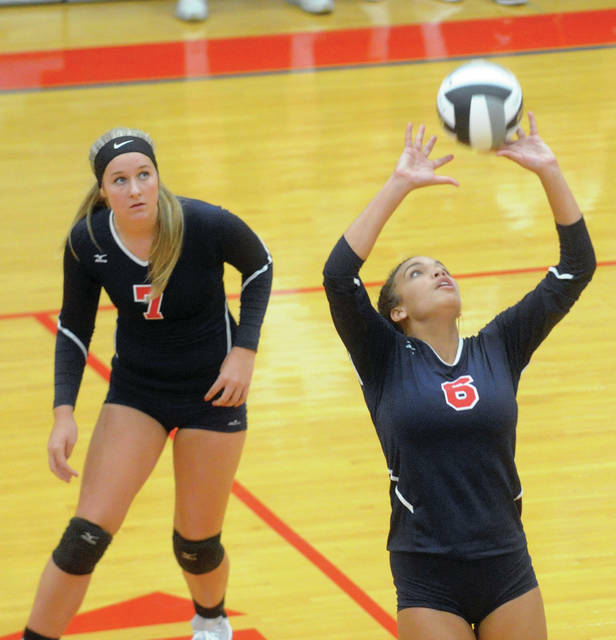 Piqua’s Kamy Trissel passes the ball against Sidney on Tuesday as Reagan Toopes looks on. 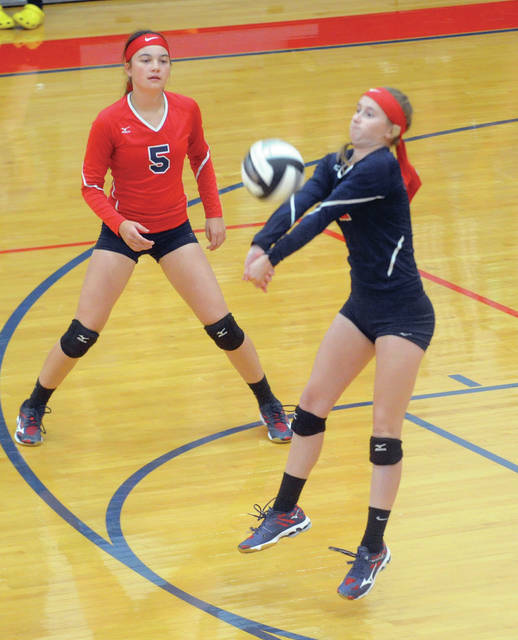 Piqua’s Tylah Yeomans sets the ball as Aubree Schrubb moves into position. 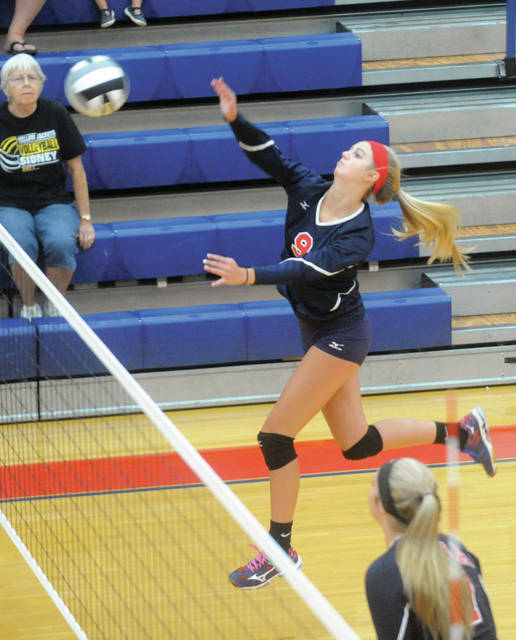 Piqua’s Haleigh Beougher sends the ball across the net. Piqua’s Danielle Widney bumps the ball over the net as Cara Reed (1) and Audrey Poling (15) look on. Sidney evened the All Sports Competition at half a point each after defeating the Piqua volleyball team 25-16, 25-17, 25-18 in GWOC American action Tuesday at Garbry Gymnasium. Piqua dropped to 0-3 overall and in GWOC American play, while Sidney improved to 4-4 overall and 1-2 in GWOC American play. After getting in an 18-9 hole in the opening set, Kamy Trissell served three points to close the deficit to 18-12. Trissell had an ace and Tylah Yeomans added a kill. Piqua had two sideouts, including a kill by Haleigh Beougher to stay within 23-15 before Sidney finished off the set. In the second set, Yeoman had a kill for a sideout and Danielle Widney served two points including an ace to tie it at 4-4. Beougher had a kill to tie it at 5-5, but Sidney was able to open an 18-11 led. Aubree Schrubb had a block to get Piqua within 20-14, but Sidney would hold on for a 25-17 win. The third set started with an ace from Audrey Poling as Piqua took leads of 2-0 and 3-1 , but the Jackets scored the next seven points. Two points by Yeomans, including a kill by Beougher brought Piqua within 11-7 and an ace by Kylie Trissell closed the deficit to 12-9. But, Sidney began to pull away. The Jackets led 20-11, before kill for a sideout by Yeomans. And at 24-15, Kylie Trissell served three straight points, before Sidney finished off the match. Yeomans had five kills, seven digs and four assists; while Schrubb had six blocks and Beougher finished with four kills. Poling had five assists and Reagan Toopes had six digs. Piqua returns to action Thursday at Greenville. BRANDT — Miami East opened Cross Country Conference play at Bethel Tuesday night, dropping a set but closing out a 3-1 victory over the Bees, 25-19, 27-29, 25-16, 25-22. The Vikings improved to 2-3 on the season and 1-0 in the CCC as they look to win a ninth straight league title. They currently have 97 straight CCC victories dating back to 2010. Nichole Hood had 15 kills, an ace, 30 digs and a block, Sophie Jacomet had 14 kills, five aces and 22 digs, Lydia Conley had five kills and three digs, Ashlyn Monnin had four kills, an assist and three digs, Macie Schaffner had three kills, 35 assists, an ace and nine digs, Delaney Bourelle had three kills, two aces, four digs and a block, Gabrielle Hawkins had 36 digs and five assists and Lauren Fisher had six aces, an assist and 14 digs. PLEASANT HILL – The Newton volleyball team lost a close match to Twin Valley South 26-24, 20-25, 26-24, 29-31, 15-12. Newton will play at Tri-County North Thursday. PITSBURG — The Bradford volleyball team lost to Franklin Monroe 25-12, 25-16, 25-7. Buzz Brewer had three kills and two points, while Maggie Manuel had two point. Macie Reck had 15 digs for the night and Bianca Keener added three kills and one solo block. 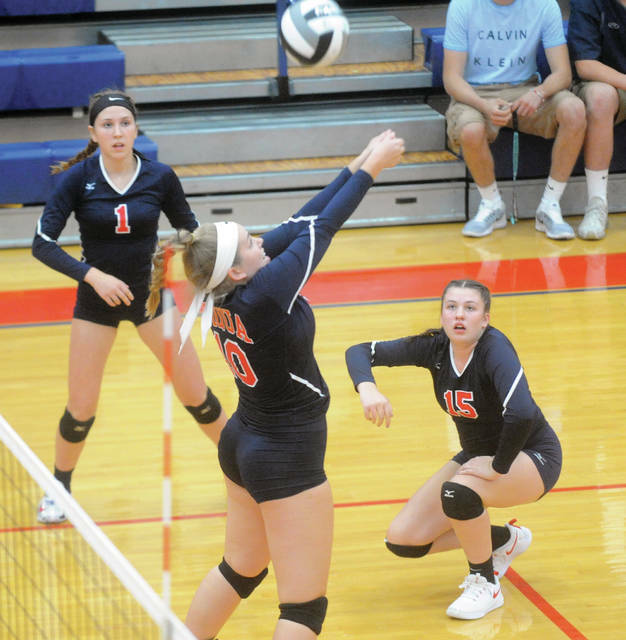 JACKSON CENTER — The Jackson Center volleyball team beat Houston 25-5, 25-19 and 25-13 in an SCAL match on Tuesday in Jackson Center. Catryn Mohler led Houston with five kills while Alyssa Kemp had three. Kemp had 10 digs and eight assists, while Allisen Foster had 12 digs. Hannah Bixler had 11 digs, Mohler had eight digs, Olivia Bowser had 10 digs and Mariah Booher had three blocks.